If you've read past posts y'all know that I was/am a huge fan of the HBO series "Treme" which was truncated, basically cancelled after the second season but allowed - no doubt out of respect for and with an eye towards future working with creator David Simon. I haven't been so in love with or immersed in a TV show since, erm, "The Odd Couple." I think I loved it for the very reasons that the mass TV audience disliked or were indifferent to it. * moved at a leisurely pace (ala classic European films) with apparently "nothing happenning"
* almost all the main characters were fairly morally/ethically/philosophically ambiguous. The worst characters inevitably showed redeeming qualities while the best of them sooner or later displayed feet of clay. And this shifted several times in the course of the series - so you witnessed just about everyone having their moments of nobility and of utter schuckery; very much like life. * it needed to be actively investigated to make sense; it was full of insider references as to local politics, Louisiana's history, local music venues, restaurants, music, neighborhood subcultures, etc. To be fully enjoyed, it had to be approached interactively, intensively and persistently over time -- the polar opposite of "Jerseylicious"
* finally -- I think the central character was...the city itself which indeed you got to know as intimately as you can through a fictive TV series. having given myself over to this pretty wholeheartedly, I will aver that I came out much enriched by it having been driven to study and collect its broad range of music (marvelling at the continuity between and coherence of what'd appear to be a myriad of styles over a period of more than a century -- being conservative), master some of its marvelous foodways and -- being buoyed by its embrace and support of vivid individuality, playful deviance and an acceptance of both life and death, lively entertainment and decay...and, finally joyful defiance in the face of adversity. (and if you think I'm making this shizz up listen to performers from Jelly Roll Morton (the vocal performances) to Big Freedia. But this particular rant is occasioned by watching the stream of "The Whole Gritty City" http://www.cbsnews.com/videos/48-hours-presents-the-whole-gritty-city/ - a documentary obstensibly about the brass band programs operating in high schools, middle schools and also via independent institutions. Beautiful, heartbreaking, inspiring in turn. You wouldn't think that being part of the school band would be much competition for joining a street gang but in New Orleans it is exactly that for many youngsters. It winds up being a means of self-empowerment and learning life skills that are invaluable in a wide spectrum of situations Black youth face in surviving and hopefully thriving in this city. Amy contributed to the Kickstarter campaign for the documentary. I contribute to the Tipitina Foundations initiative to provide musical instrument to New Orleans youth. How this ties in to "Treme" is -- actually two of the youngsters we meet in the documentary, a boy nicknamed "Bear" and a girl who goes by the name "Jazz" wound up as recurring characters in "Treme" starting in the second season - basically playing themselves; participants in after school brass band programs, enriched and excited by their experiences, the discipline, having a band leader who takes personal interest in all their students...and touched by tragedy. 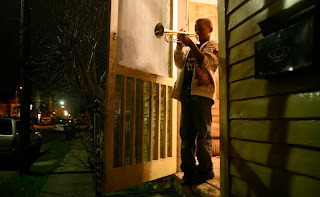 In "Treme" its Jazz whose best friend is murdered because she'd witnessed another child being gunned down, in real life it was Bear's brother who was shot and killed at age 19. Previously I'd noted that Simon had also tapped Spike Lee's documentary, "When The Levees Broke"; several people who figured prominently in Lee's film wound up as characters on "Treme" most prominently Phyllis Montana LeBlanc who played Antoine Battiste's baby momma, Desiree. It'd appear in both cases that Simon had access to these other films (all though "Gritty City" is just surfacing now, but has been in production since before "Treme" started airing) and drew directly from them for plot lines, characters, and indeed the actual people that appeared in the show. And... that's cool. Because as you view some of Simon's likely source materials and how they wound up being used...he did 'em full justice. There's no disconnects between factual material and their fictionalized incarnations in the show. Simon may have rearraanged what happened to who when and indeed created characters. But he got the overall saga straight, kept it as complicated and nuanced as it ought to be, and still turned it into coherent, to some folks, COMPELLING television. 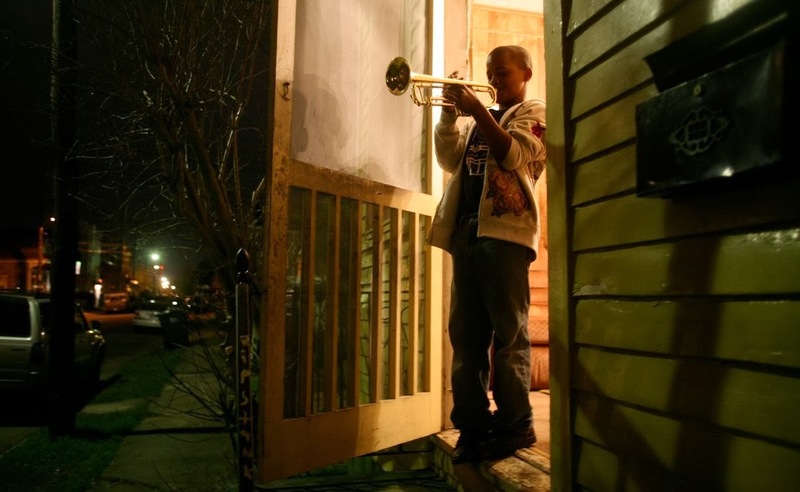 So one of the effects of this is -- that the source materials - Lee's documentary and now "The Whole Gritty City" work beautifully as companion pieces - that expand on and illuminate matters touched on in "Treme." Or you could look at it in just the opposite way. But having watched one, the other will not seem alien at all; it'll feel entirely familiar though the documentaries are more poignant and intense because - what they depict is not "just a TV show." So don't take the step further and not expect to be moved and hopefully moved to action. While some aspects of New Orleans have rebounded fantastically (i.e. hospitality industry -- I think that hotel rates are now HIGHER than they were BEFORE the "Federal Flood.") Meanwhile problems like poverty, education, unemployment still beleaguer folks down there. I'm not a fan of commenting on media coverage as it's commenting on what's often commentary to begin with - but new the Time Magazine ("Infinity Machine" cover) has a music feature equating the Beatles with One Direction titled "The Boy Band Blueprint." Which is simply DUMB. The Beatles were a rock 'n' roll band that formed, woodshedded and began writing original material without management involvement for many years. Management's input (besides cutting business deals) was largely cosmetic and some just focusing on things the Beatles had already started experimenting with - i.e. the "mop-top" haircuts their German pal Astrid talked them into trying. Even after they had management and a recording contract they STILL pursued their own agenda (i.e. championing American R&B and rock 'n' roll). One Direction et al were/are individuals who are actively, purposefully scouted by management to be made into a "group" and then intensively trained in singing, dancing, doing media interviews, have their look created by a stylist. When they record they exclusively use material by outside composers. I'm not arguing as to the comparative aesthetic or entertainment value between the Beatles and Backstreet Boys (whatever floats yr boat). But this article (mainly a big pie chart with a little fluffy commentary) shows NO CRITICAL THINKING WHATSOVER. It'd appear that some editorial meeting some top dog said "we need more Beatles anniversary coverage" and jumped at the first lame idea offered-- actual quality of content not being as important as being able to stick "Beatles" into a headline and include an iconic graphic. Meanwhile the "meat" of the piece was that marketing "blueprint" that the Beatles established was the range of personality stereotypes involved -- smart one, cute one...which is as flimsy an angle to hang an article as wet toilet paper -- you can make the same observation about ANY grouping of individuals, period. And even sticking with actual bands -- The Rolling Stones, The Who, etc. Pointing this out is mainly a function of the media looking to flesh out and personalize coverage. So, my point? Just disappointment that such a poorly conceptualized piece should take up editorial space in a publication where music coverage is exceedingly slim in a world chock full of interesting stories.